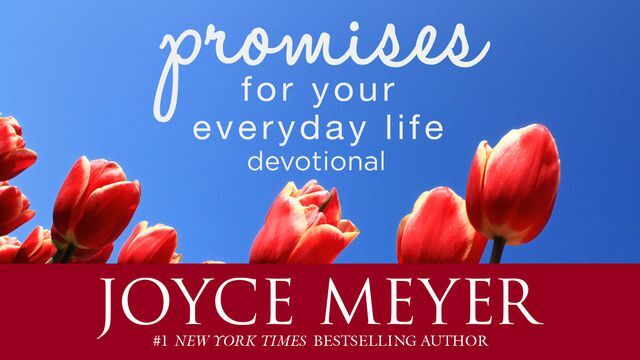 Joyce Meyer: Promises for Your Everyday Life - a Daily Devotional - Start or end your day with practical and powerful insights based on God's Word with Joyce Meyer. In as little as 10 minutes a day, this 365-day devotional will help you renew your mind and discover that a life of purpose and passion really is possible - every day! "God has perfect a plan for your life!" We've all heard that phrase, but I don't think many of us really believe it. Maybe it's the word "perfect" that troubles us. For most of us, perfection isn't even remotely involved. Perfection seems impossible. And guess what? It is! God's plan isn't perfect because we're perfect. The plan is perfect because God is the One who designed it. The perfection comes from Him and Him alone. He knows us better than we know ourselves, and He has designed and set into action a plan specifically engineered for our lives. Paul tells us in Philippians 1:6 that God saved us and started a good work in us, and His work in us will come to full completion. As we think about God at work in us, we must remind ourselves that as imperfect as we are, God is perfection. Nothing we can ever do will be good enough to satisfy God's perfection. Only Jesus, the Perfect One, is good enough. And because we are in Christ, God's perfect plan is possible for us! Prayer Starter: Dear Lord, I know that I am not perfect, but thankfully Your plan for me depends on Your perfection, not mine. Thank You so much for developing a good work within me. I trust You to complete it.